The list of names may mean little to most who pass, although many of the surnames might be recognised as having local connections. Through this blog I hope to elaborate a little on the initials and surnames which grace the corridor wall and give a hint at some of the personal histories represented. 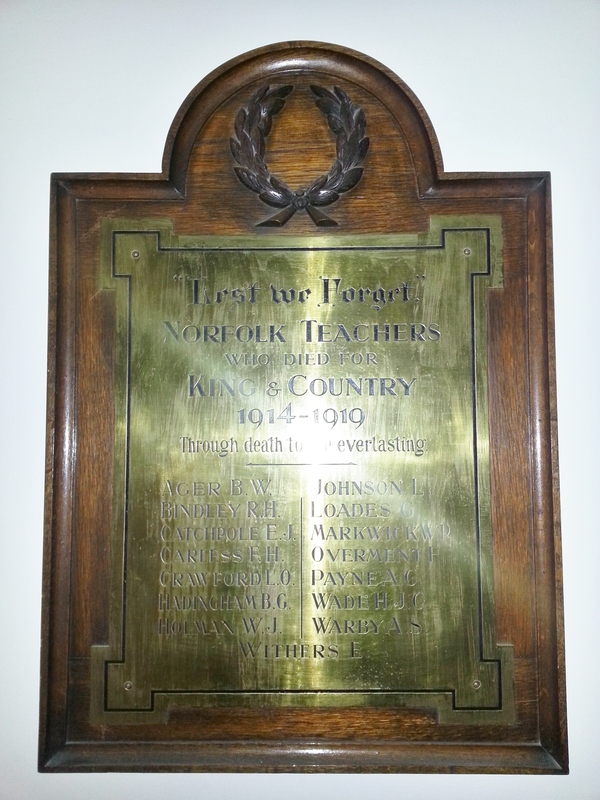 The teachers mentioned were not all born in Norfolk – one from Dorset, another from Walworth, others from Wisbech and Little Bytham in Lincolnshire for example – but all have links with the County through family, through moving to teach or by enlisting in Norwich or serving in the Norfolk Regiment. Some were from teaching families; more represent many other walks of life. A few were pupil teachers who taught in schools when they were as young as 14. Many died in France, but others served and/or died further afield – Gallipoli, Calcutta, East Africa and the Persian Gulf – thousands of miles from Norfolk. The names conceal stories of tragedy – one family lost two of three sons, a wife lost both her husband and brother, teachers in Bunwell and Mileham respectively – and the lives of these men deserve to be remembered. Through the research, albeit brief, offered here, I hope to provide more information for those interested in the men’s origins and lives before the Great War, and perhaps even alert family members to the presence of a memorial they may not have known existed. I should point out that although this memorial is present at www.roll-of-honour.com/Norfolk/NorfolkTeachersMemorial.html, not all of my research has uncovered the same results. It is important that I note that research for a memorial such as this, with no dates or places of birth, may have its faults. I would appreciate it if anybody who knows better (or can fill in the blanks) could contact me with information to improve this post – I apologise if anything is incorrect. If you know any more about these men, I’m sure the www.norfolkinworldwar1.org blog (where a copy of this new edition will appear) would love to hear from you. As with all historical research, there is always more to find, and there are more sources – which you may already have seen – which would add to these stories. The majority of this research comes from easliy accessible sources at your local library, and is not exhaustive. Benjamin Norton (William?) Ager was born in Portland, Dorset, in 1886. The 1911 census shows him in Bunwell, working as an assistant teacher for the County Council. His sisters Elizabeth Jane (who I believe possibly later married Albert Payne, a teacher in a neighbouring village also featured on the memorial) and Jane are assistant and pupil teacher respectively. The trio’s father, William, is also working at Bunwell School – as the head teacher. Benjamin’s mother, Mary, sister Lilian and nephew Kenneth, complete the household. Private Ager was killed in action in France on 11th January 1917. He enlisted in Norwich and fought in the 22nd Battalion Manchester Regiment and previously the Royal Sussex Regiment. Raymond Hall Bindley was born in Catton and died 3 July 1916 in France. He enlisted in Norwich and joined 7th Battalion Norfolk regiment (no 17148). He was awarded the Victory and British War medals. Corporal Bindley’s birth was registered in the December quarter 1893. His parents were Thomas James Bindley, a gas and hot water fitter, and Minnie Eliza Hall. The 1911 census shows him at 17, attending secondary school and living with his parents and two younger sisters, Marjorie Maggie Bindley (13) and Phyllis Beatrice Bindley (six) at 13 Patterson Road, Norwich. Francis Harold Carless was born in Walsall, Staffordshire and appears on the 1911 census working as a pupil teacher, along with his brother Ernest, for Salop County Council. His address at the time was 45, Park Avenue, Oswestry. Francis was living with his parents Fredrick (a currier) and Ada and two other siblings at the time of the census. Private Carless was killed in action on 22nd October 1917 in France. He enlisted in Norwich, so perhaps moved to the County to teach between 1911 and 1917. Like Private Warby (see later) he was part of the Royal Army Medical Corps. Edward John Thomas Catchpole was born at North End, Great Yarmouth. The 1911 census finds him, aged 19, boarding with Mary Ann Spoore at Allotment Hill, Wenhaston, Suffolk, working as a teacher in Elementary School. Lance Corporal Catchpole died 12 August 1916 in France. Like Raymond, he was part of 7th Battalion Norfolk Regiment (no 9270) and enlisted in Norwich. He was awarded the Victory, Star and British War medals. Lindsay Oswald Crawford, aged 19, was noted on the 1911 census as an assistant teacher working for the County Council. The eldest son in his family, he was named after his father, a clerk for an electricity company. The census shows Lindsay at home with his mother and father (his mother Florence Rhoda nee Corke) and four siblings – Lizzie Ada (21), Wallace John (16), Percy Graham (14) and Reginald Charles (five). Lindsay was born in Wisbech but the family moved to Cromer around the turn of the century in time for Reginald’s birth and in 1911 are living at 39, Cabbell Road, Cromer. Lance Corporal Crawford signed up at North Walsham and became part of the 8th Service Battalion Gloucestershire Regiment (267218). He died in action on 22 September 1918 in France, just three weeks before the end of the war. Bertie Gordon Hadingham ‘Certificated Assistant Teacher for the Norfolk Education Committee’ appears on the 1911 census, aged 20, at 50 Pelham Road, Norwich. Bertie was at the time boarding with the Read family headed by Edgar, a retired cigar factory foreman. The Reads’ daughter Elizabeth Agatha, 30, is also a teacher. Bertie was born in Carleton Forehoe. Lance Corporal Hadingham died on 17th December 1915 at Gallipoli and was awarded the Victory, Star and British War medals. He was part of 6th Battalion, Essex Regiment. At some time he must have moved to Westcliff-On-Sea, a suburb of Southend, perhaps to continue his teaching career – this is given as his enlistment location and residence. Tragically, his brother Donald James, also died, in 1918 respectively, leaving his parents – Hedley Hadingham born Woodton and Catherine Emily nee Wade born Stibbard – with two remaining children from a total of five, a daughter Mabel and son Lewis (one child had already passed away prior to the 1911 census). (Thanks to Mr Wray for additional information via e-mail). William James Holman was born in Narborough, the son of a gamekeeper, in 1891. One of six children – four boys and two girls – he was recorded in Narborough with his parents James and Emily (nee Finbow) and siblings in 1911. His occupation is given as an assistant school teacher at a County Council elementary school. A visitor to the household, Emma Winifred Jackson, aged 19 and born in Thetford, is also a teacher. Sergeant William James Holman (200554) enlisted in the 2nd/4th Norfolk Regiment 7th September 1914. He died 4th January 1919 in East Africa. His entry at www.roll-of-honour.com shows he may have been assistant scout-master at Attleborough at the time of his death? “Leslie Oliver Johnson was born in Tittleshall, Norfolk on 2nd February 1899, the youngest son of William & Sarah Jane Johnson’s eight children. In 1911 Leslie won a Free School Scholarship to Swaffham Grammar School (?Hammonds) and legend has it he went on to teach in Fakenham Boys School. He was eighteen and a half when, in June 1917, he enlisted in King’s Lynn. After spells of training at Rugeley Camp on Cannock Chase he joined the 3rd Bn. D.L.I. at South Shields. He sailed for France on 15th March 1918 and by the 27th had joined the 1st East Lancs. in the Front Line near Armentieres. On the 9th April they were attacked and on the 11th Leslie was taken prisoner. He served out the rest of the war in a working party close to the German Front Line until, on 11th November, his captors walked away near Waterloo. After 13 days in Brussels he began his journey home finally arriving in Tittleshall on 11th December. But the hardships endured during his captivity had taken it toll. On the 15th the Doctor ordered him to bed and rumour has it he stayed there until his death on the 15th March 1919, he’d contracted Tuberculosis. Leslie is buried in Tittleshall Churchyard. Leslie’s story came to me in the form of a Diary he started in 1918. After the war it went to his oldest brother in Canada and they kindly allowed me to transcribe it a year or so ago. In 1911 his sister Minnie was an Assistant Teacher and his brother Arthur a Pupil Teacher. Thank you Keith, for this information. George William Loades, aged 18, appears on the 1911 census in a large household led by his parents, Cubitt Woodbine Loades, born in Catfield, a railway platelayer, and Alice nee Spooner, born in Winterton. George was one of eleven children, of whom eight were surviving in 1911. George is accompanied by sisters Ethel, May, Ena, Hilda, Beatrice and Eve, and two grandparents on the household schedule. The family live on Martham Road, Hemsby, where all the children were born. At the time of the census, George was working as a game keeper. Sergeant George William Loades died on 13th October 1915 in France, having enlisted in Great Yarmouth and fought in 7th Battalion, Norfolk Regiment. George’s only brother, another George William, died in infancy several years before he was born. William Percival Markwick was born in Little Bytham, near Grantham in Lincolnshire. In the 1911 census he appears, aged 20, as a student at St Peter’s College, Peterborough. His name also appears on the War Memorial for the College in Peterborough Cathedral. The College was a teacher-training college until 1914, reopening briefly to train women teachers between 1921 and 1930. The building remains today, converted to offices and known as ‘Peterscourt’. Lieutenant William Markwick died 5th June 1918 in 5th Battalion (Territorial) Norfolk Regiment. Unlike most of the men on the memorial, William was married, having wed Florrie Brown near Huntingdon in 1915. Frederick Overment, rifleman in the 2nd Battalion The Rifle Brigade, was already a serving soldier in 1911, having enlisted at 17 in Fakenham. The schedule shows him serving at Fort William, Calcutta with the rest of the battalion in 1911. Frederick was 25 at the time of the census. He was born in Toftrees near Fakenham. Ten years earlier, the 1901 census shows him at home with his parents and siblings Sidney, Blanche and Katie. Aged 14, he is recorded as a school teacher. His mother received Victory, Star and British War Medals on behalf of her son after his death – Frederick died on 9th May 1915 in France, where he was still a Rifleman of 2nd Battalion Rifle Brigade (Prince Consort’s Own). Albert Carsewell Payne was resident in Mileham at the time of his death and is also recorded on Mileham’s memorial. Like William Markwick, he is recorded as a training college student in the 1911 census, this time at Culham College, Abingdon, Berkshire. Albert was born in Kelvedon, Essex in 1886 to farmer James Payne and his wife Helen. Private Albert Payne died of wounds 8th August 1917 in France, number 30000, 7th Battalion Bedfordshire Regiment. Albert left a wife, Elizabeth Jane (nee Ager – see above) and a baby daughter, Marjorie. Herbert John Clark Wade was born in Felthorpe and appears as an assistant school master for the County Council, aged 20, on the census return for Roughton, 1911. His father Clark was a general smith while his brother worked for a rural district council and his 14 year old sister Mabel worked as a pupil teacher. He died 14th November 1917 from wounds received on 7th November. Albert Stanley Warby was born in Walworth, London but moved with his family to 21, Clapham Road, Lowestoft between 1899 and 1901. The 1911 census shows him as a booting clerk working on Claremont Pier and living with his parents John (a house painter) and Jane, and his three surviving siblings, Gertie, Jessie and Frank. The whole family were born Londoners. His elder sister Gertie is listed as a school teacher in 1901. Private Warby, 475299, died of wounds on 4th October 1917 in France. He enlisted in Norwich and went on to serve in the Royal Army Medical Corps. He left a widow, Ida Mary (nee Smith), born in Norwich. I believe “Withers, E” to refer to William Ernest Withers, an assistant teacher in 1911, born in Fakenham before moving as a baby to Tittleshall – the village where he remains at the time of the census. William was then living with his parents, who ran a grocer and draper’s shop, his younger brother Robert and aunt Harriet. Private Withers died in the Persian Gulf on 3rd September 1916, having enlisted at Battersea and fought in the Duke of Cambridge’s Own (Middlesex Regiment). To finish, let me just say that I hope, little as I have described here, that the names on the County Hall memorial will perhaps represent a little more next time you pass. This post was originally posted at www.elizabethwalne.co.uk/blog in May 2011. It has been updated to appear here in 2014. To research your own First World War ancestors, visit a Norfolk library (including Norfolk Heritage Centre), or contact Norfolk Record Office. We have a produced a guide together with the Norfolk Regimental Museum to help you on your way, and run regular events to get you started. Corporal 17148 Raymond Hall Bindley was born in Norwich c1894. He enlisted in the 7th Norfolk Regiment in Norwich on 7th December 1914. He served in France & Flanders and was killed in action on 3rd July 1916 aged 22. He is remembered on the Thiepval Memorial Pier and Face 1C&1D and on the Wymondham War Memorial. He was the son of Mr. and Mrs. F.J. Bindley, Ella Road, Thorpe Hamlet, Norwich and was Assistant Master at Browick Road Central Boys School in Wymondham. At the time of the 1901 Census, Raymond, aged 7 was living in the household of his parents, Thomas J., aged 41 and Minnie E., aged 35 at 217 Heigham Street, with his siblings Leonard aged 12 and Marjorie, aged 3. Bindley (Norfolks), second deeply beloved son of Mr. and Mrs. F.J.
Bindley, Ella Road, Thorpe Hamlet, Norwich, killed in action July 3rd 1916. From his loving Mother, Father and Sister. Raymond Hall Bindley, killed in France July 3rd, 1916, aged 22 years. From his sorrowing Brother Leonard, USA. On 1st July (1916) the 7th Norfolk battalion marched to Hennencourt Wood. At 6:50pm they started again, under orders to occupy the intermediate line of trenches south-west of Albert, ready for an attack on Martinpuich next day. After an hour’s march the plans were changed. The 7th Norfolk remained in reserve behind the embankment of the Albert-Arras railway till 11:15pm on July 2nd when they moved into trenches for the attack on Ovillers. At 2am on July 3rd they were in reserve position for the attack which was ordered for 3:15am. As the other battalions advanced in darkness and mist, the 7th Norfolk followed through communication trenches where they encountered very heavy artillery fire, losing about one hundred killed or wounded. When they wanted bombs the whole of a party bringing them up was wiped out by machine gun fire. The attack of the leading battalions having failed, the 7th Norfolk battalion was not allowed to attack but took over the whole brigade front. Holding the line from Dorset Road on the right to Barrow Road on the left the battalion was badly shelled.